Valentine’s Day is Leslie’s favorite day of the year, so it’s also my favorite day of the year. Absolutely. I heart Valentine’s Day. 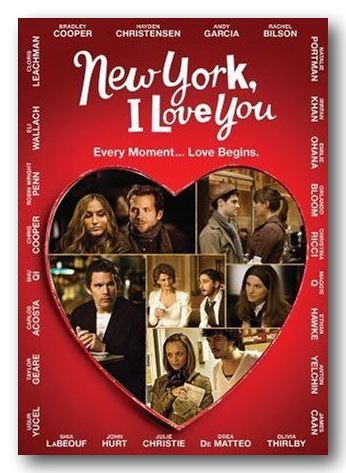 Last night we watched “New York, I Love You”, which I can recommend for The Big Day. The especially good news for you procrastinators is that the film can be streamed instantly from Netflix, and thereby save your sorry tush right up to the last minute. … a montage of segments that are really collages showcasing many different cinematic styles, with separate directors, writers, actors, and all flowing together seamlessly with overlap between segments. The funniest segment had to be with Ethan Hawke trying to pickup Maggie Q, which then sets you up for another scene much later in the film that builds upon theirs. By the way Ethan Hawke starred in Before Sunrise and its sequel After Sunset which are alternative 5 star real RomComs if you want something more conventional. There are many other dishes in this meal, and while everyone won’t love them all, there are enough tasty treats to make this a keeper. Leslie and I gave it 5 stars. And by the way, if you want to really get into the Valentine’s Day Spirit now’s the time to jump over to Leslie’s blog where she is capturing Hearts and Minds. I will watch this movie tonight. After Sunset was great BTW… so good I thought it must have been French.